Single-vineyard merlot. Yields have kept low (6 tons per hectare). Hand-picked the first week of March. Malolactic fermentation takes place in barrel and the wine was then aged for 20 months in predominantly 300Lt French oak barrels. 24% new. This Merlot has a concentrated, bright ruby red colour. The nose shows red plums with underlying aromas of dried mushrooms. A juicy and elegant entry with firm tannins. Hints of thyme and red plums on the palate. 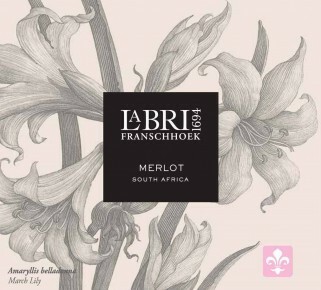 Each wine is linked to a specific flower–the characteristics of the wine are symbolized by that particular flower on the label: Merlot is represented by the March Lily (or Amaryllis Belladonna) an extremely beautiful and elegant pink flower that grows naturally around the Cape. Merlot is also seen as being an elegant, refined and feminine wine. Grapes are hand-picked from the Estate at 23,5 to 24°B in the first week of March. Malolactic fermentation takes place in barrel and then the wine is aged for 20 months in predominantly 300Lt French oak barrels (24% new).